The Idrisiyya is a Sufi order founded by Ahmad Ibn Idris al-Fasi (1760–1837). It was originally called the Tariqa Muhammadiyya. This was not a Tariqa in the sense of an organized Sufi order, but rather a spiritual method, consisting of a set of teachings and litanies, aimed at nurturing the spiritual link between the disciple and Muhammad directly. Originally based in Mecca, this tariqa is widely spread in Libya, Egypt, the Sudan, East Africa (Somalia, Eritrea, Kenya), the Yemen, the Levant (Syria and Lebanon) and South East Asia (Malaysia, Singapore, Brunei). It also has followers elsewhere, through its different branches, such as Italy and the UK. The litanies and prayers of Ibn Idris in particular gained universal admiration among Sufi orders and has been incorporated into the litanies and collections of many paths unrelated to Ibn Idris. A branch of this order was introduced in Singapore by the followers of Shaikh Muhammad Said al-Linggi (d.1926). Ahmad bin Idris had spiritual teachers in the Shadhili Sufi order and others. Although the Idrisiyya is based on a direct spiritual relationship with Muhammad, it is historically linked to the Shadhili order, as well as the Khadiriyya path of Shaykh Abd al-Aziz al-Dabbagh (d. 1719). 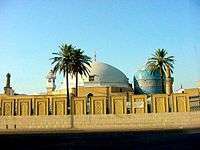 Among the branches of this tariqa are the Sanusiyya, Khatmiyya (also known as Mirghaniyya), Dandarawiyya, Salihiyya, and Ja'fariyya. ↑ Sedgwick, Saints and Sons, pp. 12, 17. ↑ Dajani, Reassurance for the Seeker, pp. 13-15. ↑ Sedgwick, Saints and Sons, pp. 18-19. Sedgwick, Mark, Saints and Sons: The Making and Remaking of the Rashidi Ahmadi Sufi Order, 1799-2000, Leiden: Brill, 2005. Hidigh, Uthman, Anīs al-jalīs fī tarjamat sayyidī Ahmad ibn Idrīs, Mogadishu, n.d., pp. 112–124. Dajani, Samer, Reassurance for the Seeker: A Biography and Translation of Salih al-Ja'fari's al-Fawa'id al-Ja'fariyya, a Commentary on Forty Prophetic Traditions, Louisville, KY: Fons Vitae, 2013.